Technology can be used for all manner of rescues. We have devices and programs that can spot and stop fires, find humans in the dark, preserve habitability in difficult environments, and much more. But what about sending another species on a rescue mission, amped up with the benefits of technology? Meet the biobots. 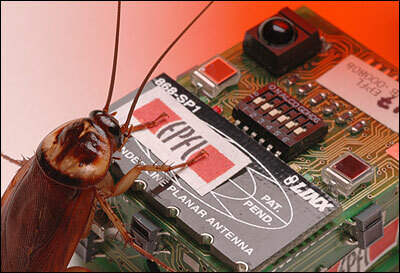 As reported by the Atlantic, biobots are basically hot-rodded common cockroaches. Armed with small electronic "backpacks", they are able to transmit sound wirelessly using a multi-directional microphone. These dispatches are analyzed by first responders and could be used to help determine everything from a leak in a pipe to a human trapped under a pile of collapsed debris. Is this the real hero Gotham needs? Dr. Alper Bozkurt, an assistant professor of electrical and computer engineering at North Carolina State University and major contributor to the project, explained, "In a collapsed building, sound is the best way to find survivors." Another type of the "backpack" the roaches can be outfitted with uses three-directional microphones to locate the source of the sound, which hopefully the roaches can be trained to pursue. The research team hopes to train the roaches to go for only the most important sounds, such as prioritizing human cries for help rather than lesser distractions. In time, these public nuisances may be recreated as creepy, crawly heroes! Then it's only a matter of time before they teach themselves to remix the sounds into funky Roachstep jams.